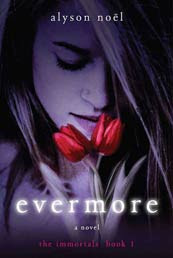 Evermore was written by Alyson Noel. It is book 1 of The Immortals series. There are 6 books in the series. Since a horrible accident claimed the lives of her family, Ever can see auras, hear people's thoughts, and know a person's entire life story by touch. Going out of her way to avoid human contact and suppress her abilities has branded her as a freak at her new high school—but everything changes when she meets Damen. Damen Auguste is gorgeous, exotic and wealthy. He's the only one who can silence the noise and random energy in her head—wielding a magic so intense, it's as though he can see straight into her soul. As Ever is drawn deeper into his enticing world of secrets and mystery, she's left with more questions than answers. She has no idea just who he really is—or what he is. The only thing she knows to be true is she's falling deeply and helplessly in love with him. When I started reading this series I have to say I assumed it was yet another vampire series. (Not that I really have a problem with that... I'm on board with the whole vampire novel obsession.) This was not vampires though. Immortals. Slightly different. No blood sucking... just elixer drinking. More of an alchemy thing. There are similarities though. If you enjoyed Twilight or House of Night I think you would enjoy this series too.